Anji Bai Cha is a beautiful tea in every sense. The leaves are long, delicate and a bright vivid green, the scent has notes of citrus and nuts, and the taste is a complex mix of tangy fresh and creamy soft. The liquor is a lively pale green with the bright clarity of a classic high-grown mountain tea. This tea was also noted as a white tea on the Canton Tea Co. website, although it is found listed as a green tea. Despite this minor confusion, I can see how it might be considered either a white tea or a green tea, because it does have qualities of both types of tea. The liquor brews up so light in color, so in that respect it reminds me of a white tea. It also has a relatively delicate flavor which is also quite characteristic of a white tea. However, the color of the leaves are so vibrant and green (they look like blades of grass!) with no real indication of the silvery color that is like other white teas. 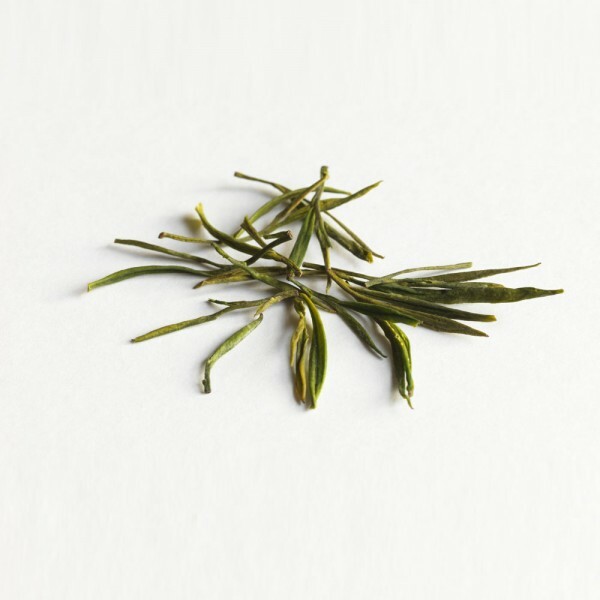 Also the flavor is much more in line with a green tea – it has a pleasant vegetative flavor that is not overly grassy. It tastes more like steamed broccoli than it does grass. There is also a very delicious, juicy fruit note to this tea that is reminiscent of sweet apples. The crispness in the tea enhances this taste beautifully! It tastes very much like a high quality green tea to me. Yes, I like this one very much… call it a white tea, call it a green tea… I call it GOOD tea!